I decided at the last minute to attend the InControl conference in Cincinnati, OH. The cheapest flight I could find was to Dayton, OH it was an hour or so outside of Cincinatti, OH. My friend Christopher said he’d pick me up and I booked the flight on Airtran. The interesting part of the story is that while boarding my flight from San Francisco to Atlanta I noticed this sign on my plane. 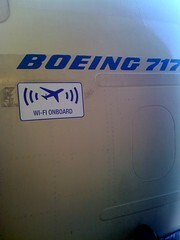 Airtran’s latest promotion is to have wifi on all of their planes for Summer 2009. Now what is a geek girl to do when faced with a shiny new toy to play with on a plane for 5 hours? She tries it out that’s what she does! I travel with my 17” Macbook Pro, insane I know but I love it. Go Go supports numerous mobile devices too. Laptops:The cost was $12.95 for me to use the wifi on my laptop for this flight since it was longer than 3 hours. For flights less than 3 hours it was $9.95. If I flew constantly for 30 days it would be $49.95. 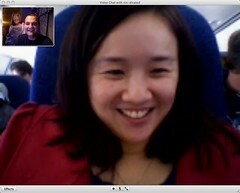 Video Chatting on an airplane! I wanted to kick the tires a bit and I tried out the wifi by surfing around until I did video chat with my boyfriend in England while flying somewhere over Texas. The video quality was pretty good. I was surprised. 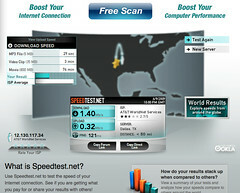 I even tried the speedtest. I was on an AA flight a couple of weeks back from NY-SF and got a chance to try go go. I wont usually pay for wifi hotspots. But i geeked a little and had to give it a try. Overall i was pretty impressed too, handled the basics perfectly. Woud be interesting to try some Wifi Mario Kart or maybe fire up Counter Strike. This would be killer during long haul flights (so long as there is a power outlet on your seat).